Compare prices from several car hire companies in Fuerteventura and find the best price for car rental. Our prices always include unlimited mileage and insurance. 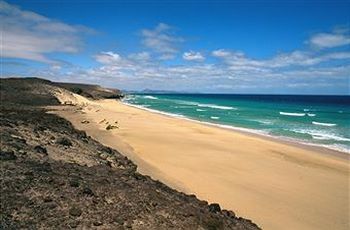 Fuerteventura is the second largest island in the Canaries archipelago. The islands are located off the west coast of North Africa and belongs to the Kingdom of Spain. There are approx. 75 000 (2003) inhabitants of Fuerteventura. Many tourists travel to Fuerteventura because of the long, golden beaches, but the island also has more to offer. Let Latija Zoo is a zoo with birds, crocodiles, monkeys, camels and horses. In the city Betancuria can visit an art museum and a historical museum, while La Rosita is a kind of outdoor museum in the small town of Villa Verde. La Rosita is intended to show how it was on the island before tourism began to appear and boasts a museum, wine cellar, a tobacco plantation and farm animals. Fuerteventura Airport is located approx. 30 km outside the capital Puerto del Rosario.